The new interactive Global Map of Dietary Calcium Intake in Adults, launched today by the International Osteoporosis Foundation (IOF), reveals that many populations are not getting enough calcium in their diets. The Map reflects the findings of a recent study published by an IOF Calcium Steering Committee. Why is calcium intake a concern? Calcium is a major component of bone, accounting for between 30-35% of its mass and much of its strength. Low calcium intake has been linked to lower bone-mineral density, which increases the risk of osteoporosis and broken bones. The amount of calcium needed varies at different stages of life. Calcium requirements are especially high in the teenage years due to the rapid growth of the skeleton, and at older age, when the body's ability to absorb calcium declines. In older adults, bone loss occurs at a rate of about 1% per year, resulting in calcium loss of approximately 15 g per year. The recommendations for daily calcium intake vary by country, however 800-1000 mg/day is generally recommended for healthy adults, with higher amounts recommended for teens, postmenopausal women, the elderly, and people with osteoporosis. Foods rich in calcium include all dairy foods (milk, yoghurt, cheeses), certain vegetables (e.g. broccoli or kale); whole canned fish with soft edible bones such as sardines; some nuts; calcium-set soy products (tofu, soy milk); and some mineral waters. At a special symposium held today at the World Congress on Osteoporosis, Osteoarthritis and Musculoskeletal Diseases in Krakow, Poland, experts discussed the IOF Global Map of Dietary Calcium Intake in Adults and the implications of low calcium intake for the global population. 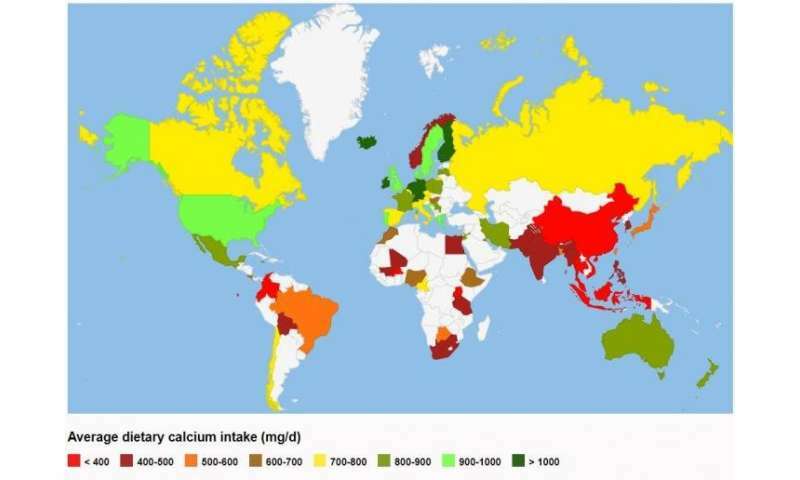 Across the 74 countries included in the Map, the estimate of average dietary calcium intake among adults varies widely, from a low of 175 mg/day in Nepal to a high of 1233 mg/day in Iceland. Countries in Asia, Africa and South America mostly have low calcium intakes, ranging between about 400 and 700 mg/day. Countries with average calcium intake greater than 1000 mg/day are all in Northern Europe. There can be large variation within regions, such as in Latin America, where Colombia has an average intake of only 297 mg/day, in contrast to 805 mg/day in Mexico. Dr Ambrish Mithal, co-author of the study and IOF board member from India, stated: "The Map reveals that in many parts of Asia and Southeast Asia the population has extremely low intakes of calcium in the diet, with levels often less than 400 to 500 mg a day. In China and India, the world's most populous countries, the average intake is shown to be only 338 mg/day and 429 mg/day respectively." Professor Wei-bo Xia, president of the Chinese Society of Osteoporosis and Bone Mineral Research, noted his concern about the low levels of calcium intake in China, where hip fracture rates are rising rapidly in the older population. He stated, "Hip fractures are the most serious, costly, and life-threatening fractures due to osteoporosis. Future projections for China indicate that by the year 2050, the number of hip fractures will exceed 1 million unless action is taken." He also noted that high phytate intake in relation to low calcium intake is an additional aspect of concern in China. Phytates, found in certain plant foods such as rice, beans and legumes, inhibit the absorption of calcium and other nutrients. Senior author Professor Bess Dawson-Hughes, chair of the IOF Calcium Steering Committee and director of the Bone Metabolism Laboratory at Tufts University in Boston, commented: "Increasing calcium intake throughout the lifespan is an important strategy to improve bone health. We encourage people of all ages to meet their calcium intake requirements by consuming a variety of calcium-rich foods. For people who may not be able to get enough calcium through their diets, calcium supplementation may be needed to reach the intake requirement of 800 to 1,000 mg/day. This is particularly important for older adults who do not consume enough calcium-rich foods. In this population group, calcium supplementation combined with vitamin D, may lower the risk of broken bones." The IOF Global Map of Dietary Calcium Intake is an educational resource that draws attention to the problem of inadequate calcium intake. 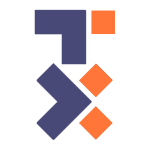 The objective is to mobilize health care providers and healthcare authorities worldwide to develop appropriate strategies to address low intake of this important nutrient, especially in regions where dietary intake is critically low. How do our bones get calcium and why do they need it?